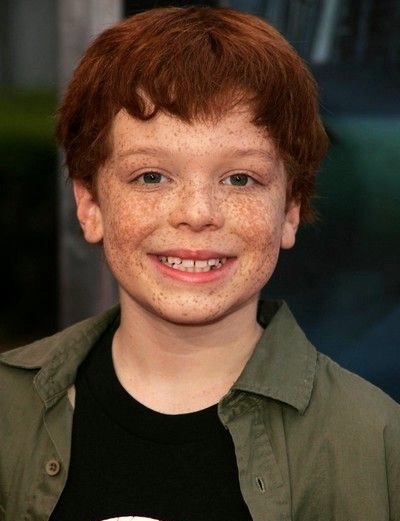 Young Artist and TV Line Award-winning actor, Cameron Monaghan is best known for portraying a role of teenager Ian Gallagher on series, Shameless. Similarly, he is also one of the eminent characters of the popular television series, Gotham. He plays a role of Jerome Valeska. Cameron was born on August 16, 1993, in Santa Monica, California to an insurance claims specialist mother, Diane Monaghan. He first started working as a model before entering the world of film industry. While Monaghan was at the age of three, his mother sent his picture to modeling agencies. At that time, his photos were liked by many people. Following modeling, he then appeared on the cover of his first catalog at the age of five and in a regional commercial at seven. Handsome Gotham actor, Cameron young age photo. The handsome actor attended the Addison Mizner Elementary School where he started to honed acting skills. In that respect, he appeared in the Little Palm Children's Theatre's production of Stuart Little, The Pumpkin King, and Winnie-the-Pooh. After working several years as a model, Monaghan then began his career as an actor in the year of 2002. His first role was in the film , The Wishing Stone where he portrayed a role of the Alex. Likewise, a year later, he then made his appearance in the television series, The Music Man. Till the recent times, Monaghan has also been nominated for Young Artist Award for three times, Critics Choice Television Awards, and Teen Choice Awards. More recently, he has appeared in the films, The Year Of Spectacular Men, Amityville: The Awakening and series, Son of Zorn. Likewise, he has also won the TV Line Award for her role Jerome Valeska in the series, Gotham. Aged 24 handsome American actor, Monaghan is currently living a single life. It is hard to believe that, the diligent and hardworking actor is single. Despite his massive popularity, it is quite impressive that he has managed to keep her personal life details so low. Once there was a rumor of him about being a gay. However, he later stated it as false by tweeting "This is the only time I will answer this here. No, I'm not gay. Yes, I play a gay character. No, the question should not be relevant." Adding, "Thanks for the kind words, everyone. It feels a bit odd to 'come out' as a straight guy." Currently, Monaghan seems to be focused on his career and has kept himself away from being in the relationship. At the early age, Monaghan was able to accumulate a decent amount of money. As of now, he has played in numerous television series and films. As of 2017, his net worth is estimated at around $2 million. Besides acting, he is also a good musician and athlete. He has an interest in an instrument such as guitar, drums, harmonica and sports, boxing, bicycling and so on. Similarly, he is a former student of Taekwondo, kickboxing, and XMA.